Toddlers can throw a tantrum like nobody else. They feel big emotions and don’t know how to handle them—making tantrums a mess for everyone. Here are tips for the next time your little guy or gal melts down. Tantrums can be loud, so try to bring your toddler’s volume back down with your own voice. Whisper encouraging words to your tot or try out some new knock-knock jokes; whatever you feel like saying, just whisper it. There’s a great chance your soft tone will pique their curiosity enough that they’ll quiet down to hear what you have to say. If you’re in a place where there’s no chance your toddler can run off or hurt herself, try ignoring her for a few minutes. Some tantrums are fueled by attention—even negative attention—so ignoring it can take some of your toddler’s angry power away. Sometimes a tantrum needs to run its course. Let your toddler know that you’re going to give him a safe place to process his big feelings. This could be a crib, a room, or your arms—anywhere he can be free to scream and cry safely until it’s over. We’ve all seen a screaming, crying toddler rolling around on the floor at the store, so when it’s your turn, have a plan. Typically the tantrum starts when your little one is denied something they want. It’s a big inconvenience for you, but your best bet is to pick up your little one and leave until she's calm. Letting her know that there's no way her behavior will be rewarded can prevent meltdowns next time. Is your little one pitching a fit? Turn on your favorite song and start dancing. Boogie down and make it look fun—your toddler will probably want to join in. If you’re not in the dancing mood try sitting quietly with a coloring book and some crayons or start having fun with a toy—anything to coerce your kiddo to cheer up and play. Is your toddler freaking out about needing ice cream for breakfast instead of the eggs you’re already making? Instead of arguing about it or getting angry, get repetitive. Pick a calm explanation of the situation and stick to it. No matter what your toddler says or does just keep saying, “ice cream is not breakfast food. We’re having eggs.” Eventually they’ll get the idea that you’re not going to budge. Toddlers don’t have the experience or words to let you know what they’re feeling. It may not seem like the most teachable time, but tantrums can be a good time to expand your toddler’s vocabulary. Start by telling your toddler, “You look frustrated/angry/upset/sad.” After a few tantrum vocabulary lessons your toddler should be able to tell you, “I’m angry,” which is a good foundation for him to learn to tell you why he feels that way, too. Having to wait your turn on the swings may not seem like a big deal to us, but to your toddler, it’s like the end of the world. Instead of making your toddler feel bad by saying something like, “stop crying, you have to wait,” try validating their feelings instead. If you can say something like, “I know it’s hard to wait. It’s OK to feel upset. Let’s play in the sand box until it’s your turn,” you’re letting your little one know you’re on their side. 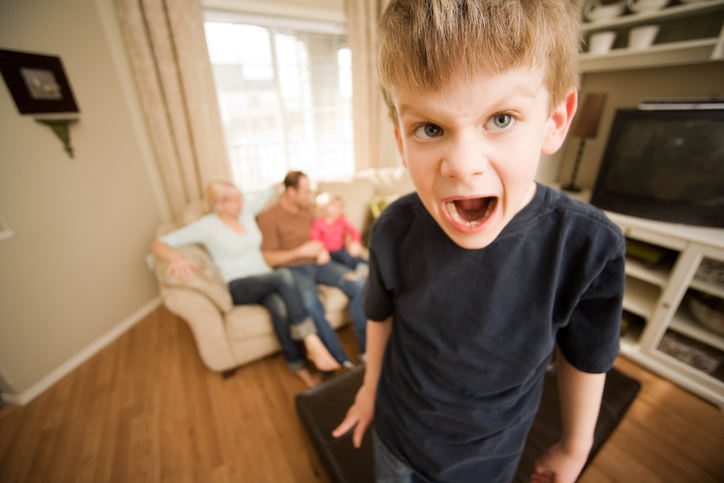 Offering a solution can help end a tantrum and teach coping skills. Tantrums can often happen when your little one is hungry or tired. When your toddler starts going nuclear offer her a healthy snack and some snuggles. Sometimes all your kiddo needs is a fistful of cereal and a hug to help her reset, relax, and fall asleep. If shopping is an issue, remind your toddler before going in that you’re buying milk and bread—NO toys or candy. When it comes up inside the store it’s easier to remind them of your goals. If tantrums happen before dinner or at bedtime, try starting the process a few minutes earlier, or give them an activity to fill the down time. Tantrums are a part of life, and with some preparation you can get through them faster or prevent them entirely.